When educators and community leaders in Grand Rapids found that 36 percent of the students in the public schools missed nearly a month of school every year they knew they needed to turn around school attendance. 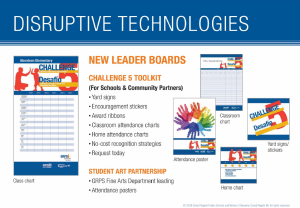 Their response was a simple, actionable challenge to reduce absences for all students, combined with increased attention to data and support for students and families with serious barriers to getting to school. The results have been startling: Over the past three years, these efforts have brought down chronic absence rates by 25 percent and engaged the entire community. Grand Rapids Superintendent Teresa Weatherall Neal credits a community-wide approach for attendance improvements. “That has been the secret for the Grand Rapids Public Schools,” she said. Grand Rapids’ campaign, a partnership between the school district and the Believe 2 Become initiative, builds off the training and professional development provided by Attendance Works. It also complements a broader, regional initiative led by the Kent School Services Network (KSSN) involving community schools in several local school districts. The gains in attendance and achievement in the district didn’t appear in the first year, said Mel Atkins, Executive Director of Community & Student Affairs for the school district. The campaign kept meeting and fine-tuned its strategies. Internally, Atkins intensified professional development for principals so they understood and consistently implemented high-level strategies to reduce chronic absence. Externally, the campaign partners and developed a more concrete attendance message that parents could grasp. It’s called Challenge 5, and it urges students to strive to miss fewer than five days of school each year. The message appears in both English and Spanish on posters and stickers at school, and on billboards along the roadway and yard signs around town. A giant leaderboard for Challenge 5 sits at the entrance of every school, giving a monthly update on how each grade is doing on the challenge. Challenge 5 provides both attendance incentives, as well as the unifying theme for agencies and community partners. Three years after the attendance campaign was launched the district sees a direct correlation between attendance and student achievement. The most recent NWEA test scores indicate that students who have satisfactory attendance are 6 times more likely to be reading on grade level than students who are chronically absent. That number jumps to 51 times less likely to be on grade level for severely chronically absent students who miss 20 percent or more of the school year. Similar success is seen with the latest math scores: Students who have satisfactory attendance are 5 times more likely to be on grade level than students who are chronically absent. The Grand Rapids campaign goes well beyond the attendance challenge message. Attendance Works helped to develop a data-driven strategy for monitoring chronic absence and intervening with students who are missing too much school. Attendance teams at each school keep track of who is chronically absent and reach out to students and families to turn the trends around. The teams, which meet weekly, include a worker from the local department of social services and a community school coordinator in addition to the school principal, nurse, attendance secretary and district family support specialist. A focus on data transparency and data sharing was key to community engagement. Using a groundbreaking Master Data Sharing Agreement (MDSA), the district pushed out the chronic absence data to community partners. B2b managed more than 150 organizations. Neighborhood engagement organizations, knocked on doors, held community meetings, made home visits and partnered with schools to hold monthly Parent Essentials meetings to keep the issue of chronic absenteeism every before parents. Businesses partnered with KSSN to support incentive programs in the schools. Churches committed to talk to their members about the importance of going to school. Find out more about the Challenge Five strategy, including how to download a free toolkit, on the Believe 2 Become website.